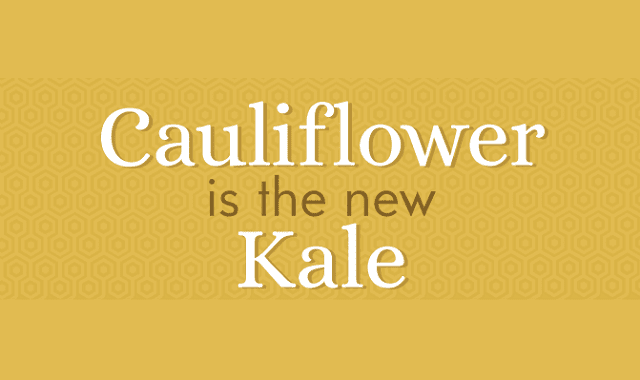 Cauliflower is the New Kale #infographic ~ Visualistan '+g+"
Move over, kale. This year’s newest food craze is cauliflower. This low-starch, high-nutrition cousin of broccoli is quickly taking center stage as the food trend of the moment. Cauliflower’s winning trait is its versatility. Look past the boiled and bland dish your grandmother used to make, and you’ll find that people are experimenting with preparations that are way outside the box. Cauliflower is a cruciferous vegetable, meaning it’s a member of the cabbage family. It’s related to kale, cabbage, and broccoli, and it contains many of the nutrients common to this family that can’t be found in most other vegetables.